and…they are out! Here you go! Need help planning your visit to the happiest place on Earth! Give me a call! 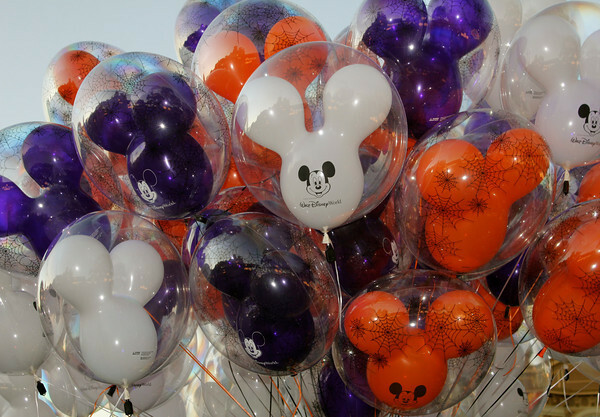 This year, Mickey’s Not-So-Scary Halloween Party will be held 25 nights throughout the months of September, October and November. And, will be held 20 nights in November and December. Epcot Food & Wine Festival! See what’s NEW! The Epcot Food & Wine Festival will be held September 19-November 10, 2014. If you have been before have you thought of possibly enhancing the experience? Here are NEW special events that will debut for 2014! Are you wanting to Indulge but stay on a budget? The Food & Wine Gift Card wrist band is a great option! Just load it with any amount over $5 and swipe wherever you choose! A new all-inclusive event is planned for Disney’s Animal Kingdom. Called Harambe Nights, guests will have a chance to celebrate the 20th anniversary of The Lion King. The evening starts with a reception, and then the party moves inside the Harambe Theater. There will be a performance of the show The Lion King: Concert in the Wild, which will feature a live orchestra and a celebrity narrator. 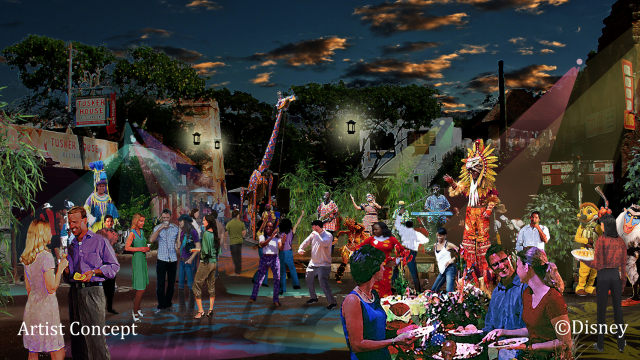 After the performance, guests will attend a party in the streets of Harambe which will include food, local bands, character appearances, autographs, and a chance to purchase event merchandise. The evening will end with what Disney is calling a “fond farewell”. A separate ticket is required to attend Harambe nights. 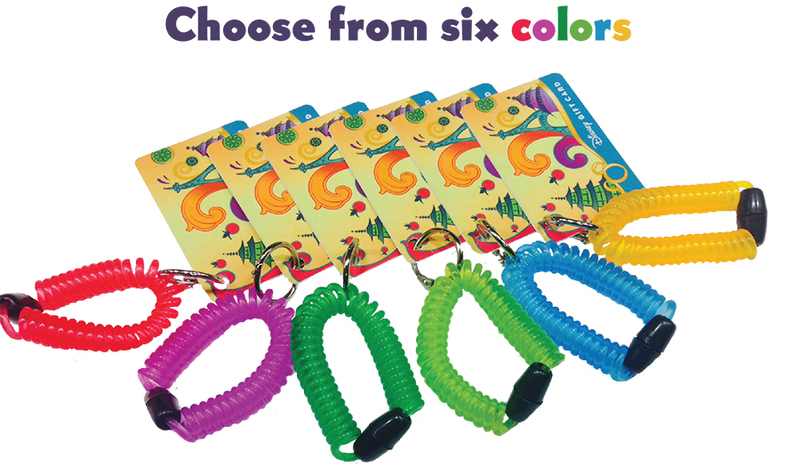 The cost is $119 per adult, $79 for each child ages 3-9. A premium ticket is also available, which will give access to special seating for the show. The price for the premium ticket is $134 for adults, $94 for children. Tax is not included in the price. Reservations are recommended and can be made at https://disneyworld.disney.go.com/events/harambe-nights/purchase, or by calling (407) 939-1319. The price includes the reception, the show, and the street party. Food and beverages, including African beers and wine for those of age, are also part of the price. The rides and other attractions will not be open during the event. But I’m a planner! Especially when it comes to Disney! and these will sell out! Disney has always known how to keep the crowds coming! They are constantly developing new programs and ideas so returning guests don’t repeat the same experiences over again. This went over well last year so it’s back for 2014!! 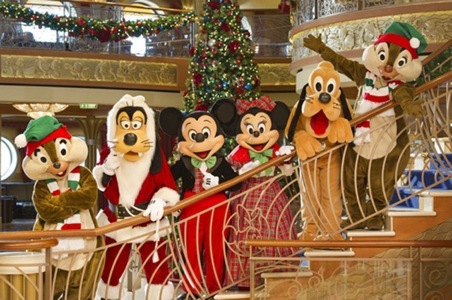 What could be better then spending Christmas 2014 on a Disney Christmas cruise! A New Year’s Eve Celebration at the Happiest Place on Earth! If you are lucky enough (judging by how you handle the crowd factor) to bring in the New Year at Disney World there is plenty to keep you busy! Starting at the Magic Kingdom….They will feature not one but two nights of fireworks to bring in the New Year! Disney’s Hollywood Studios will feature the Mulch, Sweat and Shears New Years Eve Spectacular. 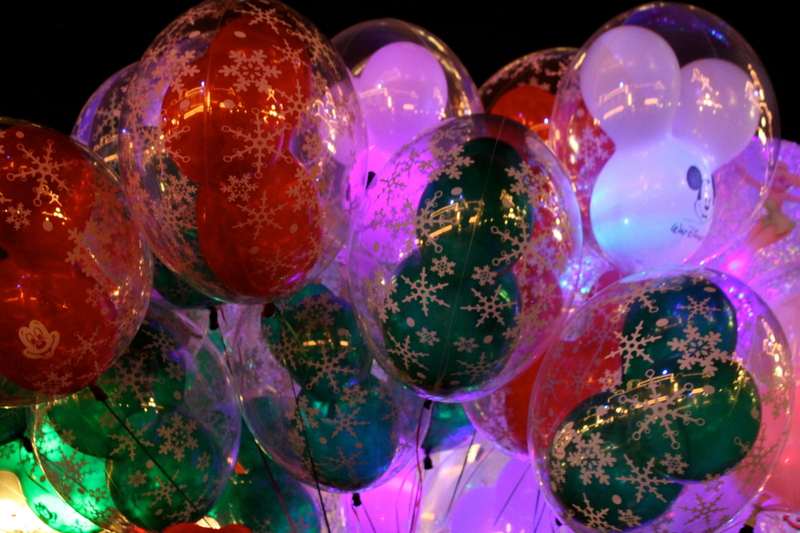 The party starts at 6pm on Dec 31st with a countdown to Midnight! Epcot …will feature two showings of IllumiNations and a New Year countdown! In the World Showcase you will have a variety of DJ’s located at select pavilions and the World Fountain Stage. and DisneyQuest has a party all their own…. This is a “Special Ticket” event. Click below for note info…. Did you know that you can surprise someone special in your life by including a Disney-themed Welcome or Birthday “In-Room Gifting Experience” with their package. These personalized celebrations can be set up in your Disney hotel room to create a one-of-a-kind experience, as if Mickey and the gang created a magical moment just for them. A “Surprise” door sash hangs outside of their Walt Disney World® Resort room door to announce something special is waiting on the other side. A personalized tote bag, Mickey ear hat and pillow blanket all wait to be discovered with a special message from Mickey in an official autograph book. An issue of Disney’s ToonTown Times features a headline covering your much anticipated arrival with the inside scoop and all the must-see happenings on property. A “Surprise” door sash hangs outside of their Walt Disney World Resort room door to announce something special is waiting on the other side. Inside, the room is sprinkled with confetti, balloons and treats. The birthday Guest can dress in a candle-covered top hat and “Happy Birthday” lanyard. An issue of Disney’s ToonTown Times features a headline covering their much anticipated celebration along with the inside scoop and all the must-see happenings on property. When the party is over, you can snuggle up with the Mickey plush and an exclusive Mickey pillow blanket. 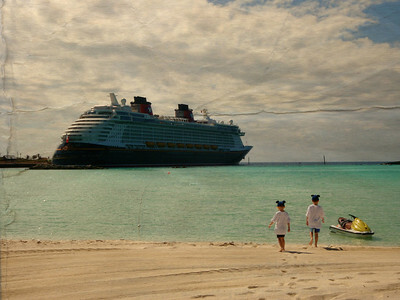 It’s a great way to make your trip even MORE Magical!! “In-Room Gifting Experiences” cannot be added within seven days of arrival. They are never delivered on arrival date, but rather the second day of the stay. 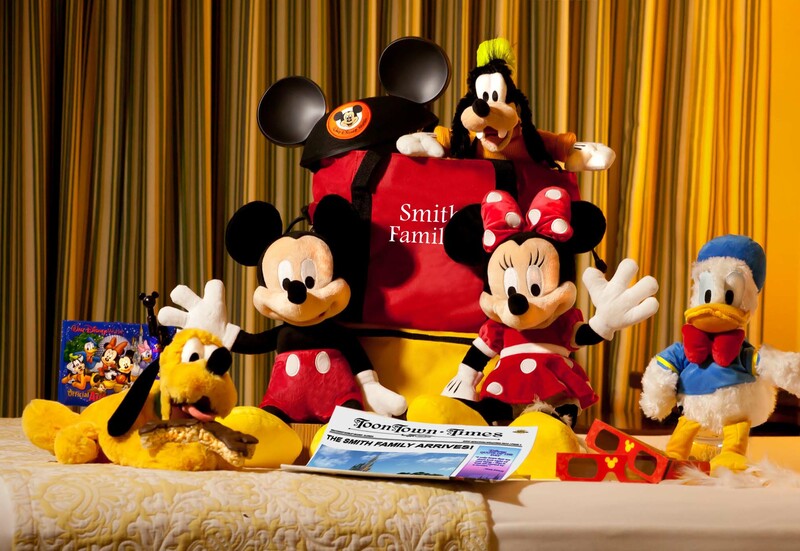 Packages can have multiple” In-Room Gifting Experiences.” Only available at Disney Resort hotels. Disney Floral & Gifts may substitute any product, as necessary, to maintain the integrity and quality of the gifting experience. “In-Room Gifting Experiences” are non-refundable due to the customized content. Have you received a Magic Band yet? FAQ Questions from ORLANDO ATTRACTIONS MAGAZINE! This is a great explanation of the NEW MAGICBAND Phenomenon! The MagicBands will be free to all Disney resort guests and annual passholders. Other guests will receive a card as their park ticket. Those guests may upgrade their ticket to a MagicBand for a small fee once that service launches. Because the MagicBands can be read by short- and long-range readers and the cards can only be read by short-range readers, there will be certain “magical” things that will happen only for MagicBand wearers. For example, your name may be said in an attraction or by a character, or some other personalization may happen somewhere in Walt Disney World as you walk by. What should I do if I lose my MagicBand? To take advantage of some of MyMagic+ features and benefits, you’ll need to give Disney some personal information when you sign up online. But if you don’t mind losing some of the benefits, you can opt out of giving them part of your information or all of it. You can also opt out for your children. UPDATED 9-5-13: You’ll still be able to get in the park and use some of the MyMagic features using your card ticket, if you receive one, including FastPass+. If you don’t have a card, you’ll need to visit guest services at the park. UPDATED 9-5-13: You’ll get one automatically when booking a stay at Disney’s resorts but you don’t have to use it. With the new system, you can have multiple MagicBands and card tickets all connected to your account. They will all work independently of each other. But keep in mind that you may not get some of the MagicBand benefits if you don’t have it with you. FastPass+ will still work with your card ticket. Can I re-use my MagicBand on my future visits? UPDATE 9-5-13: Disney sells buttons, sliders and sleeves for the bands. Disney is also selling T-shirts that have various designs using Magicbands. You can find them at most of the resorts that are testing the bands. There is only one size available but it is supposed to fit on the wrists of 95 percent of guests. Kids and those with small wrists can peel away part of the band to make it smaller. 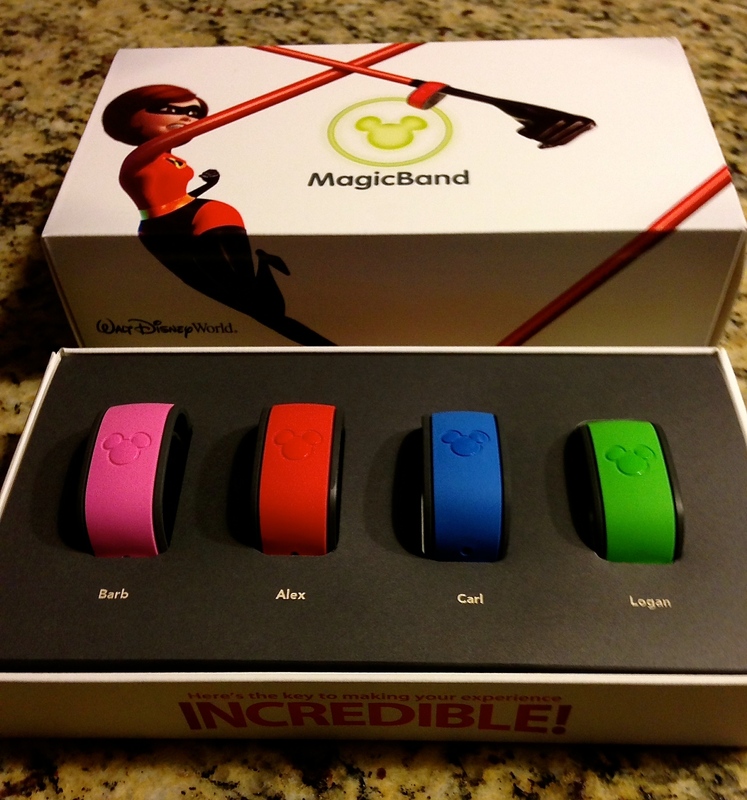 UPDATE 9-5-13: If you book your Disney resort stay about 10 days ahead of time, you can customize your MagicBand by choosing the color you want and the name you want printed on the back through Disney’s website. If you don’t choose your color, they will automatically give you a gray one. The only feature we’ve seen so far is in the Disney Infinity video game. Touch the MagicBand to the base and the Disney Dragon appears. 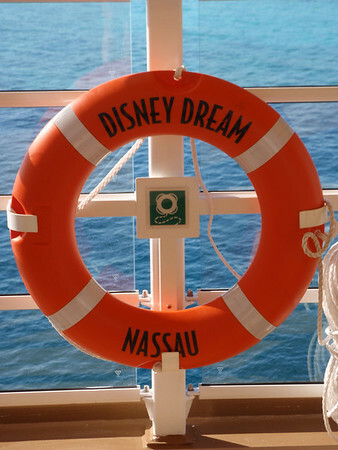 NEW 9-7-13: What if I’m buying my tickets or booking my Disney resort through a third-party? You should still be able to register on Disney’s website and look up your hotel reservation and link your tickets to your online account. UPDATED 9-3-13: If you’re not staying at a Disney resort and you don’t pay the fee to upgrade your card ticket to MagicBand, you should still be able to link your ticket to the My Disney Experience app and use FastPass+. UPDATED 9-5-13: Yes, you can change them anytime up to your FastPass return time at one of the many stations around the park or through the My Disney Experience app. If you miss one of your FastPass return times, you can reschedule it for a different time or attraction. UPDATED 9-5-13: Maybe. We read in Disney’s FAQ that you won’t be able to, but we were able to do it. If you have your card ticket or hotel room card with you, give it a try. (Resort guests are given the MagicBands and a backup Key to the World card.) In fact, we were able to book three FastPass+ times plus get a old FastPass with our room key and another one at the same time with our card ticket. UPDATED: 11-12-13: Some resorts will begin testing only giving guests MagicBands and no hotel cards, or their hotel cards will not have a magnetic stripe needed for the old FastPass machines. These guests will only be able to use FastPass+, and not the old FastPass machines. Yes, you will be given a one-hour window to return to the attraction in most cases. Some things, like the parade and show return times, are shorter. UPDATED 9-5-13: You will be given a chance to pick a new FastPass attraction. You will also receive an e-mail telling you it’s no longer available. About 10 minutes before our FastPass+ time started for Test Track, we received an e-mail saying the attraction was temporarily unavailable. The e-mail listed several other attractions and said we could ride one of them anytime we wanted the rest of the day. We didn’t need to reserve a time or attraction. We just had to show up to ride. You may wait and see if the original ride you wanted reopens or go ride a different one. The old system had 28. The new one has more than 60. Disney has added FastPass+ to many attractions and experiences that never had it before, including some quick service restaurants, shows and parades. NEW 9-5-13: Can I use all three of my FastPass+ reservations for the same ride, so I can ride it more than once? Maybe. 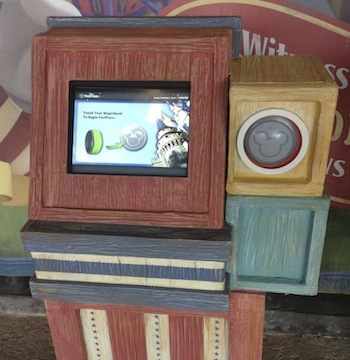 Disney’s Website, app and kiosks don’t allow you to, but you may be able to do this with the help of a cast member. NEW 9-5-13: If I go to an attraction at my FastPass+ return time and see there is no line, can I change that experience to a different one? Yes. If you don’t scan in at that attraction, then you may change it to a different one. But once you scan in, the attraction is marked that you used one of your three for the day. UPDATED 9-5-13: This allows you to have a guaranteed spot for whatever you book. You can reserve a FastPass+ for a parade or fireworks show and not have to sit on the curb for hours for a great viewing spot. You can get a FastPass for Be Our Guest quick service at lunch and not have to wait in line. The Be Our Guest test is currently by invite from Disney only. Disney hasn’t said, but we expect they will hold some back from being booked until the day of. But like the current FastPass system, FastPass+ reservations for popular rides may be gone at various times each day. NEW 9-6-13: Will FastPass+ be available during special ticketed events such as Mickey’s Halloween and Christmas parties and Night of Joy? No, neither the traditional FastPass system nor FastPass+ will be available during the special ticketed events.